Verubulin, Radiation Therapy, and Temozolomide to Treat Patients With Newly Diagnosed Glioblastoma Multiforme. Ombrabulin is a synthetic water-soluble analogue of combretastatin A4, derived from the South African willow bush (Combretum caffrum), with potential vascular-disrupting and antineoplastic activities. 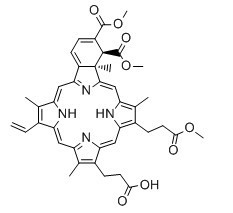 AZD6126 was being investigated by AstraZeneca as a VDA (vascular disrupting agent).AZD-6126 is an angiogenesis inhibitor and tubulin inhibitor potentially for the treatment of solid tumours. BNC105P is a benzofuran-based vascular disrupting agent (VDA) prodrug with potential anti-vascular and antineoplastic activities. BNC105 is a tubulin polymerization inhibitor with potent antiproliferative and tumor vascular disrupting properties. 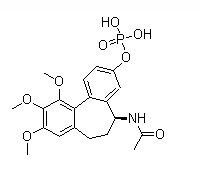 Verteporfin, a benzoporphyrin derivative, is a medication used as a photosensitizer for photodynamic therapy. NPI-2358 (Plinabulin) is a novel vascular disrupting agent (VDA) with an IC50 of 15 nM against HT-29 cells.